At a first listen, Visions is poppy, silly and sensually chilling. The second and third listens plant hooks in your ears and you pick up on little, pop easter eggs that you didn’t know were there. Boucher cites a handful of inspirations in the interview: “crap like” Disney soundtracks, Christina Aguilera and Mariah Carey among others. The Mariah Carey is obvious in the sometimes shrill but beautiful range on tracks like “Circumnambient” and “Skin”, though it sounds like Carey collaborated with Gary Numan and Depeche Mode. Aside: I don’t want to be the one to tell Grimes, but I don’t think she’s got a shot at a Disney soundtrack contract unless they decide release a really bizarre, straight-to-video Mulan 3 (yep, they made a second). Mulan Rouge? “Genesis” reminds me of Gang Gang Dance’s (also of 4AD) “Adult Goth” in that it would be best served in a haunted hibachi grill. Perhaps that’s why Grimes gets pegged as “witch house?” “Oblivion” blends a pleasant Korg synth with ‘lalalalala’ bubblegum vocals and Eno-like piano toolings. Aside (Again): I wish I could make a music video for Grimes’ “Eight.” Picture a mandroid shopaholic amazed by the selection of neckties in a department store, being talked out of frivolous purchases by a Korean chipmunk. Robot: TIES, TIES. TIES, TIES. TIES, TIES. Ties, ties. Korean Chipmunk: That tie looks awful. Bold paisley’s ugly. Somehow I know that you’ll never listen to me. “Eight” shows that Grimes isn’t unwilling to get a little weird and I like it. “Vowels = Space and Time” and “Be a Body [untranslatable Asian character]” could easily get a mainstream club audience dancing. “Colour of Moonlight” recalls Prince’s Purple Rain and has me wondering: is this what it sounds like when the droids cry? On “Skin” Boucher sings in a velvety falsetto “Soft skin, you touch me within and so I know I could be human once again.” I sympathize to a certain extent but I don’t know, Claire. I kind of like you the way that you are. 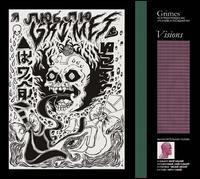 Visions is one of my favorite records of 2012 thus far; it doesn’t have a single track to apologize for. 2012 has ushered in a new pop terminator princess. I am also very interested in how Grimes translates her bedroom imagination to the stage and so I will be buying a ticket to any show within geographical reason. Grimes a fellow-Montrealer. It’s always nice to read something positive about one of us other than William Shatner.